Members of Lindfield Bonfire Society will be breaking with tradition at this year’s celebrations on Monday 5th November. For the first time ever, part of the firework display will be fired electronically. Traditionally every firework in the spectacular display is set off by hand by highly skilled bonfire society members. 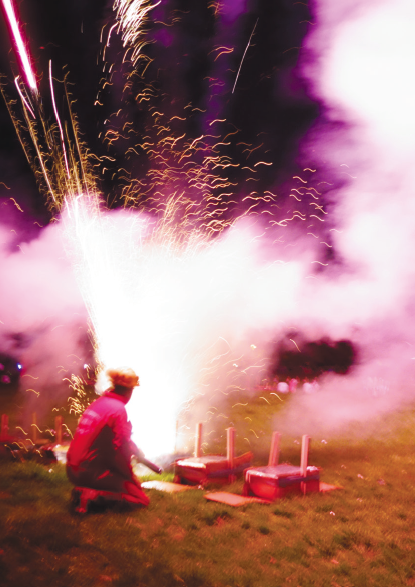 This year, however, the society is trialling a new electronic method to increase the skills of the firing team and to prepare for a possible future health and safety rule which would prevent firework displays from being hand fired. The event will also commemorate several longstanding members who have passed away this year, as well as the centenary of the WWI Armistice. The programme cover, designed by Leesa Le May, marks 100 years of Votes for Women and the First World War armistice, and children of all ages are invited to colour in the picture and enter a competition. Entries should be dropped off at Masters & Son, Lewes Road, Lindfield before 18th November. As usual the event will begin with the judging of the fancy dress competition in the King Edward Hall at 6.30pm. There are classes (and prizes) for children up to 15 years, adults and groups. Bonfire societies from Chailey, Burgess Hill and South Heighton, and the Burgess Hill Youth Marching Band, will be joining the torchlight procession which will leave the King Edward Hall, via Black Hill, past The Witch and stopping at Hickmans Lane to re-torch before proceeding down the High Street and on to the Common. *All timings are approximate and subject to weather conditions. The High Street and Black Hill will be closed for the entire evening, parking in the village will be restricted and visitors are advised to walk to the event. Parking and a viewing area will be available for disabled visitors. Contact the society for more details. The street collection on the night will support local charities: Chestnut Tree House, Court Meadow RDA, C.L.A.P.A., Kangaroos & Orchard House.